I love how Magnum regularly has a series of very creative limited editions with a theme. I first wrote about it in the *first month* I started blogging – April 2002. I was in Melbourne, Australia and the 7 Deadly Sins just came out, with a flavor for every sin. There was also a wonderful 9-ice cream series called The Sixties Nine that came out the next year and I reviewed every single one! 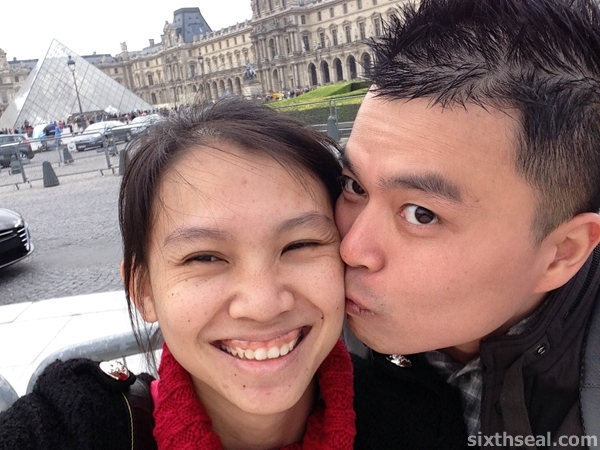 We were in Paris, France earlier this year when we spotted the new limited edition 5 Kisses series. 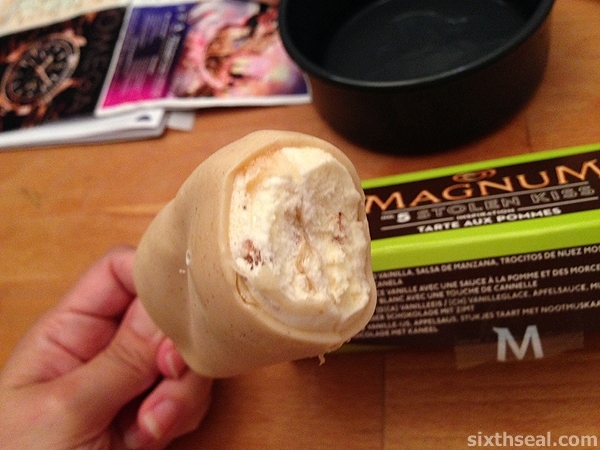 There are five (5) different Magnum ice creams in total and we got some to eat. 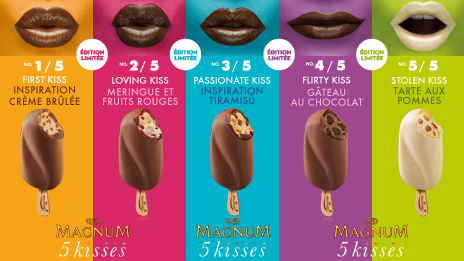 The Magnum 5 Kisses is a range inspired by French Patisserie flavors and it came to Australia recently (although we ate ours in France). Magnum No. 4 Flirty Kiss Gateau Au Chocolat is the full-on chocolate flavored one. It’s a chocolate ice cream with chocolate sauce and chocolate brownie pieces, all coated with a layer of crackling milk chocolate. 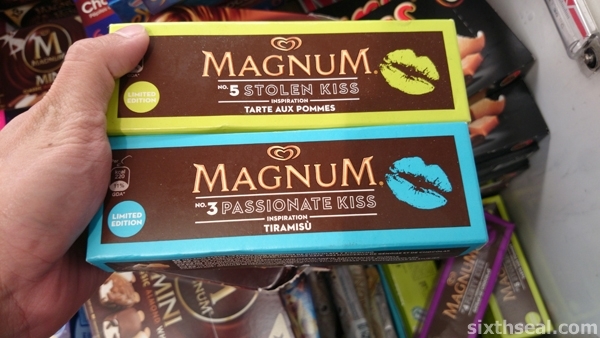 Each of the Magnum 5 Kisses retails for €4.19 at the local Monop’ which isn’t very cheap when converted – almost RM 18 per Magnum! However, some of them are very good. 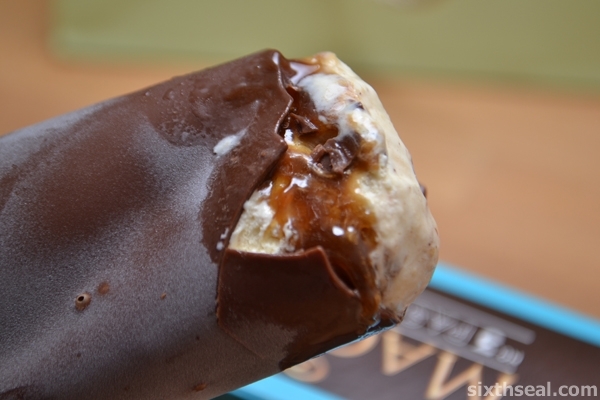 We liked Magnum No. 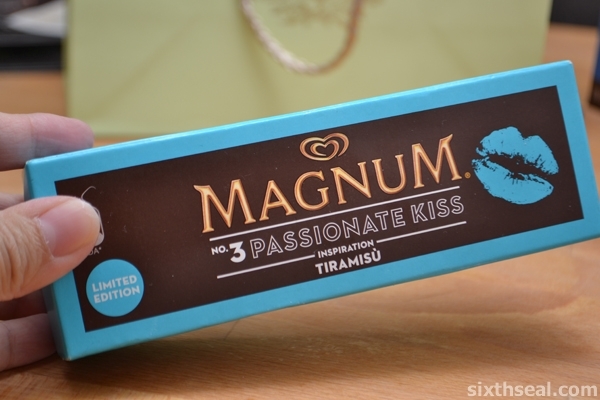 3 Passionate Kiss Tiramisu – it had a distinctively authentic taste, with mascarpone flavored ice cream (!!! ), coffee sauce, chocolate chunks and sponge pieces, all coated with a layer of crackling milk chocolate. Both of us thought it was awesome! 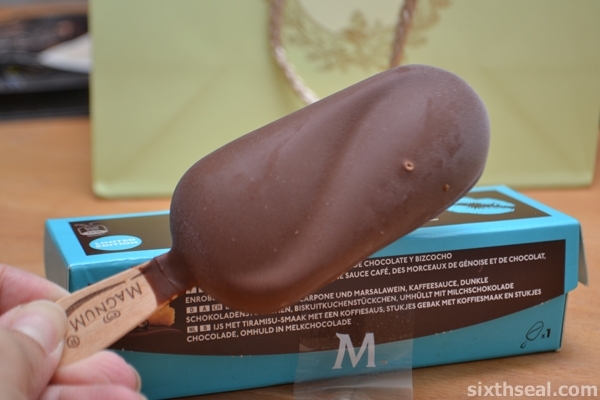 The boxes that contains the Magnum 5 Kisses are made well, with sturdy cardboard and a perfect ice cream inside. 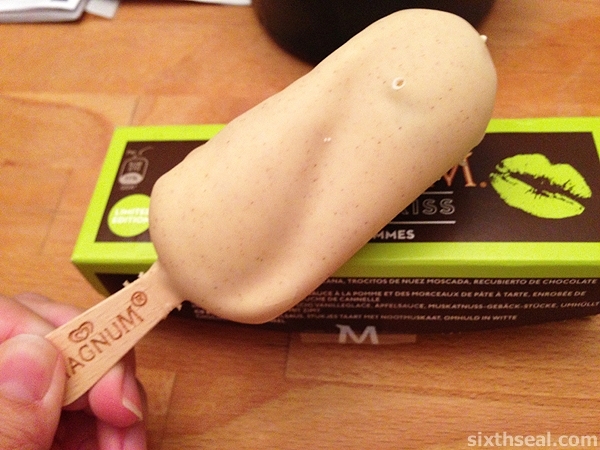 The construction of the Magnums are spot on too – every single element can be seen and tasted! 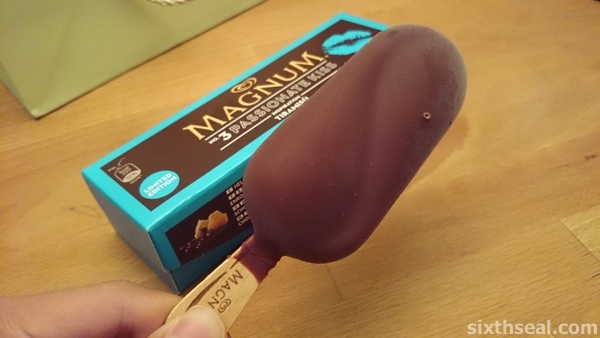 The best in the series though would be the last one – Magnum No. 5 Stolen Kiss Tarte Aux Pommes. This is made with a vanilla ice cream interior, apple sauce and pastry pieces, all coated with a layer of crackling white chocolate dusted with cinnamon. It’s the only one of the 5 Kisses that has a white chocolate exterior and it tastes exactly like an apple pie! 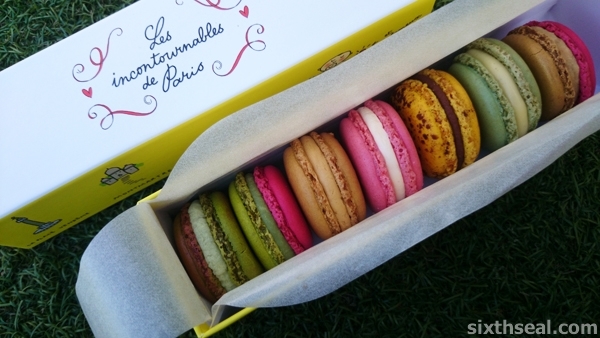 The macarons from Pierre Hermé are the best macarons I’ve ever had in my entire life! 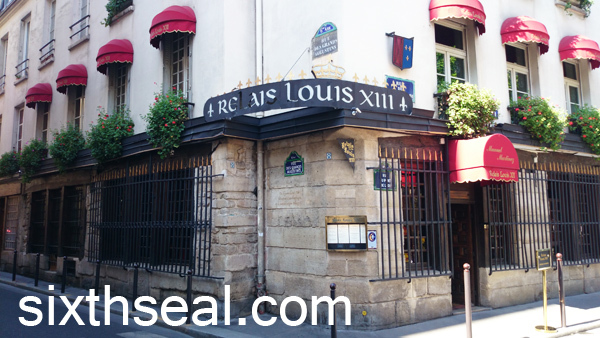 It was the first place my better half wanted to go to when we were in Paris earlier this year. 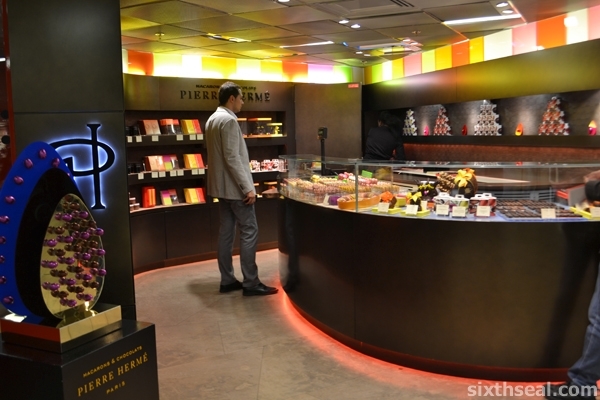 We went to two of his shops – the original one is at Pâtisserie Pierre Hermé Paris in Bonaparte but their Macarons & Chocolats Pierre Hermé Paris boutiques at Galeries Lafayette has seating arrangements! 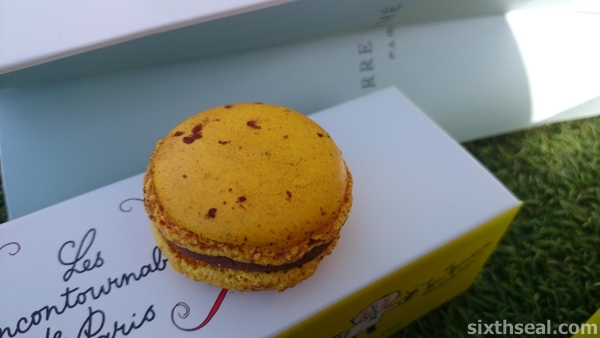 Pierre Hermé also sells a wide variety of fantastic chocolates and pastries but we were here for the macarons so we got a pack of 7 macarons and opted to eat at the beautiful rooftop with an amazing 360 degree view of Paris instead of at the boutique itself. 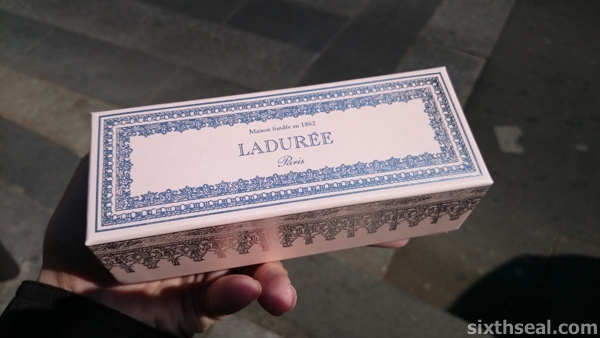 My dear liked the Les Incontournables De Paris (The Essentials Of Paris) box so I got that for her. It costs €18 for a box of 7. 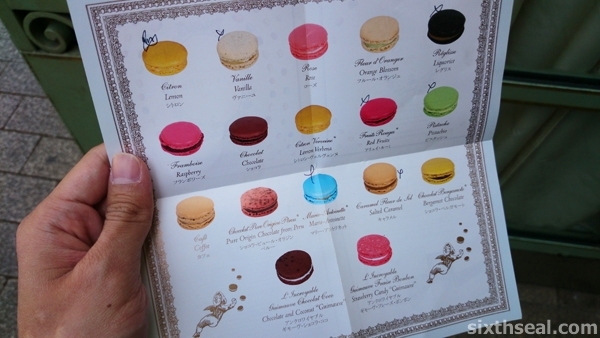 The friendly attendant was even kind enough to let us pick the flavors (it’s supposed to be a fixed box set) and even include *limited edition macarons* from the Pierre Hermé Paris ‘Les Jardins’ Collection 2014! 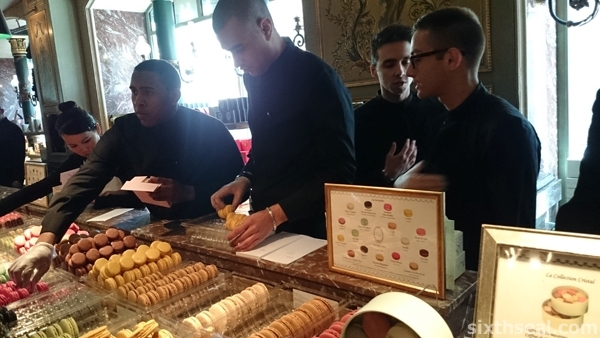 Pierre Hermé has a total of 23 (!!!) 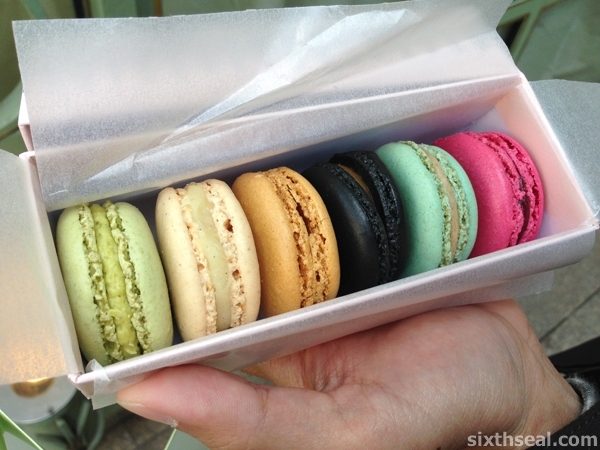 flavors of macarons at any time. However, most of their box sets have a theme e.g. 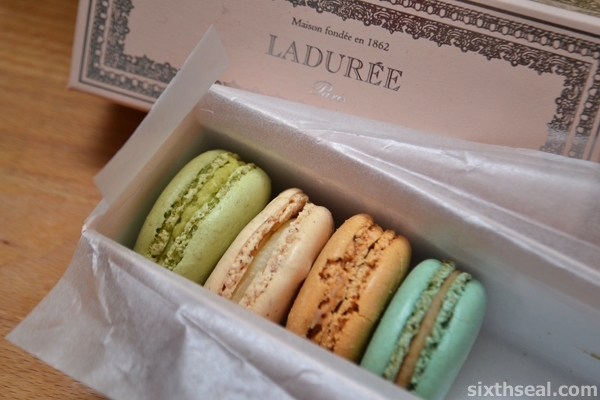 the Initiation 20-piece Assortment (€59) only has 4 different types of macarons. 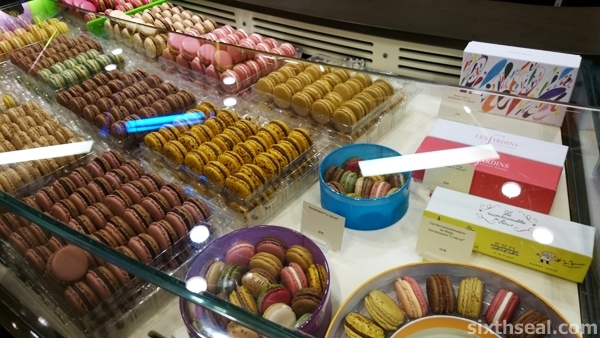 There’s no set price per macaron, it depends on what you get and the price can range from €2 – €3 per macaron. 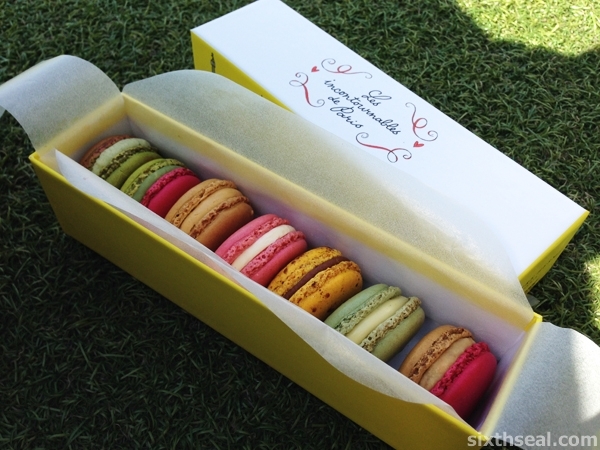 We got ours for slightly over €2.50 each (about RM 11 per macaron). I just love how weird and quirky the flavors are! It’s not just for the “wow factor” too, the combinations works very well! My first choice was the delectable Huile d’olive & Vanille with bits of *real* green olive! 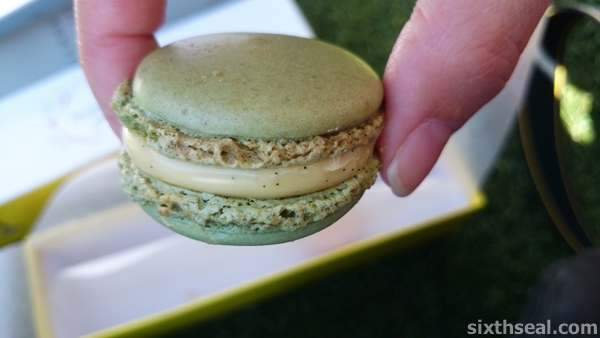 I’ve never had an olive macaron (with REAL olive pieces inside) before and we both loved it! 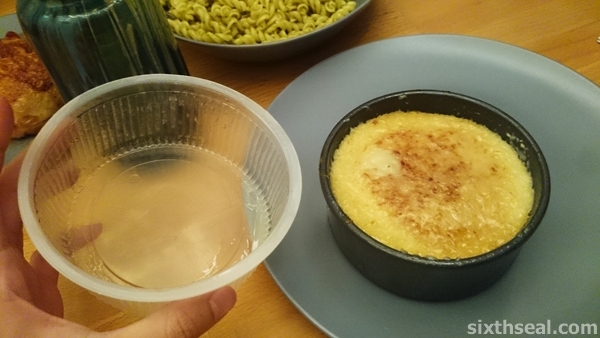 My dear went for the Crème Brûlée which actually tastes remarkably like the real thing! I couldn’t believe it. 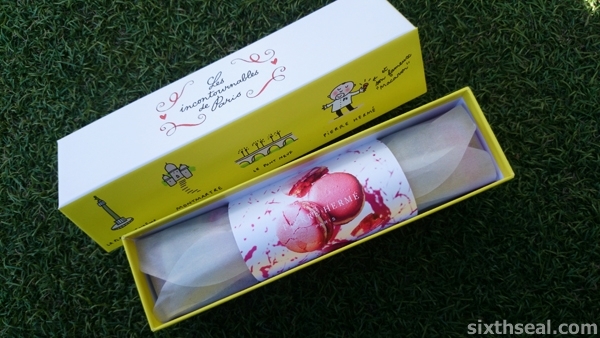 The delicate Infiniment Rose is made from rose and has rose petals (!!!) 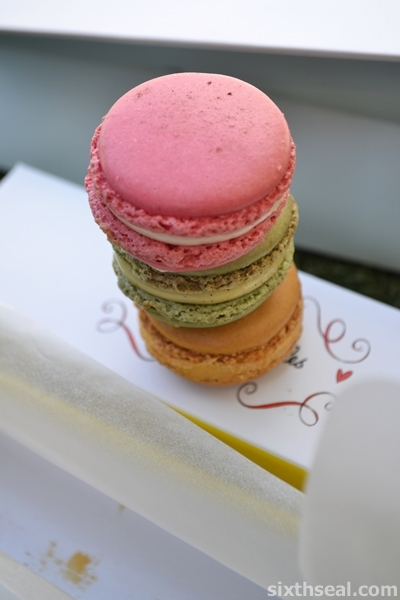 in the macaron! 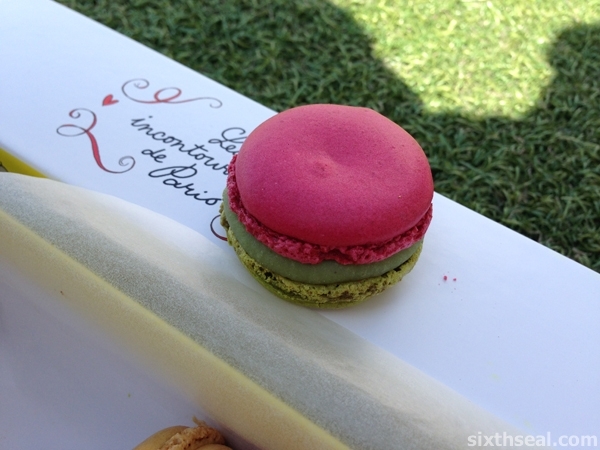 We loved every single macaron – there were no duds or mediocre ones in the box, every single macaron was balanced well, not the sickly sweet macarons we get here but an amazing symphony of perfection. The other highlight was Jardin des 8 Trésors – the April 2014 monthly limited edition macaron from the Pierre Hermé Paris ‘Les Jardins’ Collection 2014 with 8 different Asian treasures packed into 1 macaron – lotus seed, red date, wolfberry, rosebud, dried orange peel, dried longan fruit, chrysanthemum and osmanthus with incredibly complex flavor and texture profiles. 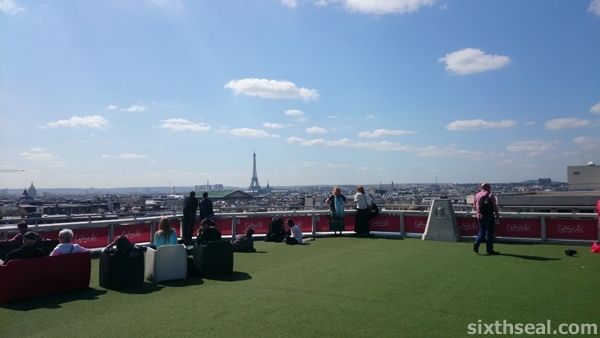 We were munching on the macarons in a sky park on top of Galeries Lafayette on a sunny spring day with lots of other locals camped out to enjoy the fresh air and the amazing panoramic view of Paris. 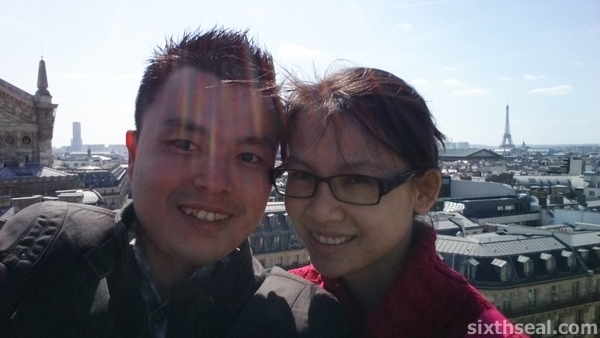 It was one of the highlights of our trip – enjoying good food, each other, and the Parisian experience! The statement above is perfectly correct and true! I present to you, a line of ready-to-eat meals by Joel Robuchon! 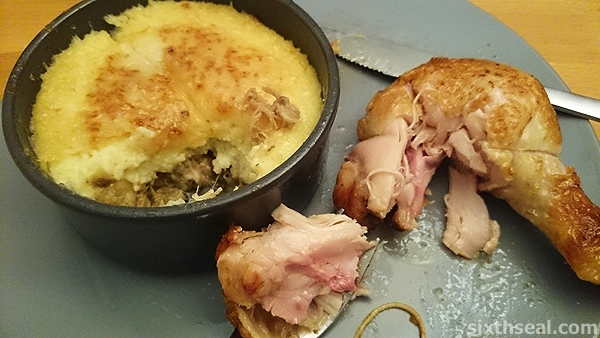 This is his Le fameux Parmentier de Canard or “The famous Duck Parmentier”. 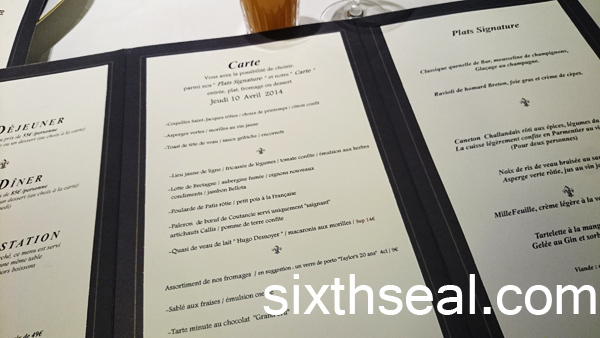 There are several different meals, partnered with Fleury Michon. 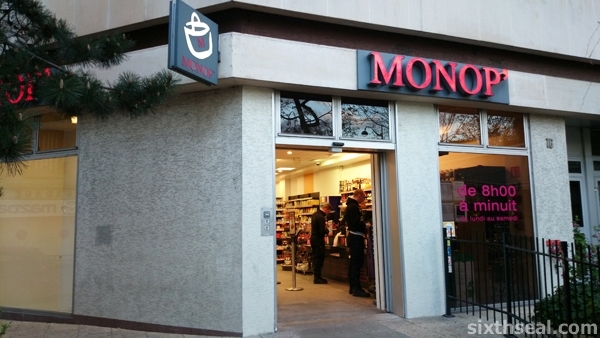 It’s sold in supermarkets and convenience stores like Monop’ (of the Monoprix chain – they have everything from stores to all sorts of food from cookies to milk!). There was a Monop’ just around the corner from our apartment and we were so tired the first evening we arrived in Paris that we just wanted to cook something easy. 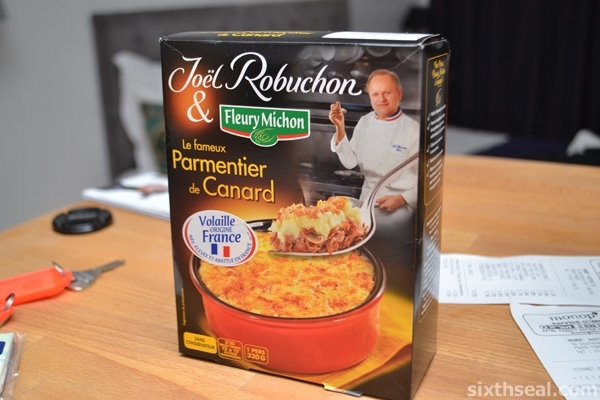 I was quite surprised to see Joel Robuchon lending his name to what seems like TV dinners but such an American term would be out of place in France for this is one quality meal for 5.13 Euros! The serving bowl it comes in is not made of disposable and flimsy plastic but solid ceramic! Duck Parmentier is a classic French dish that looks like a cottage pie. 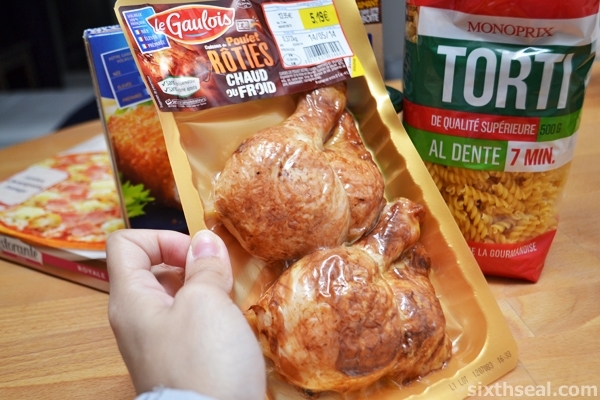 We saw some Cuisses du Poulet Roties (Roasted Chicken Thighs) on sale for 5.19 Euro (original price 13.95 Euros). These are the miniature chicken breeds (also called bantam chicken) which you can *fit in the palm of your hand*! They’re really quite cute (and tasty)! 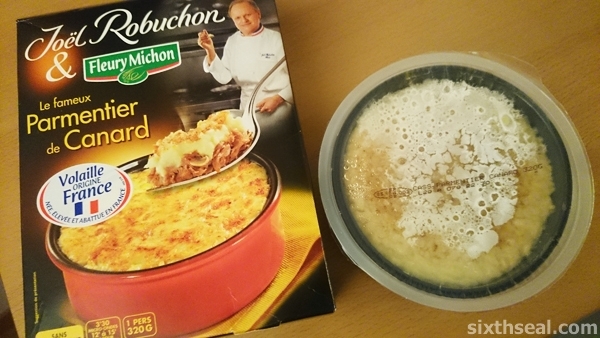 I used that to plate up the dish so it looks like the serving suggestion (just 3 minutes 30 seconds in the microwave) and we ate it with some pasta for our first night in France. It was quite delicious, despite being a ready-to-eat dinner. They pride themselves for ingredients being 100% sourced from France too, as the labels clearly states. I’ve always wanted to bring my better half to a Michelin star restaurant coz she’s never eaten at one before and decided it would make a great birthday present for her! I booked a table for two and set aside one day in our Paris vacation for this. Oh, and did I mention that Picasso used to live across the street? 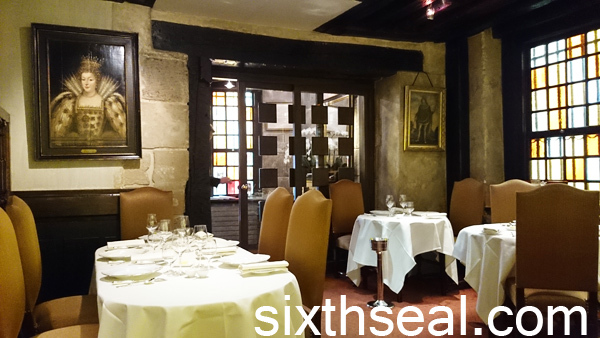 Relais Louis XIII is a very historical restaurant and they’re proud of it – the interior has the original old stones, wooden beams and valuable portraits of Louis XIII and Marie de Medicis as well as stained glass windows and antique Louis 13 chairs. I had booked a spot at 12:15 pm when the restaurant opened and the waitress patiently explained and translated each of the menu items from French to English for us! 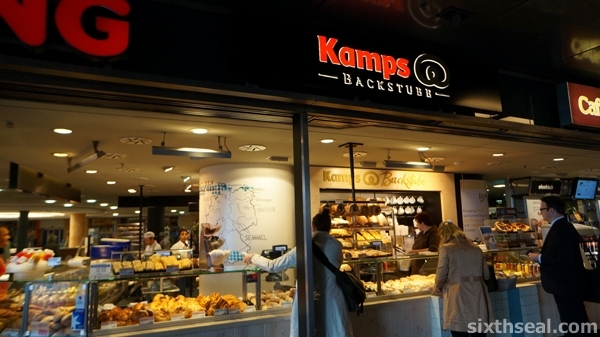 There is no English menu, but the staff can speak English so there’s no worries there. We were served warm cheese puffs upon arriving and the table is perfectly set with butter, salt and pepper as well as a bread tray. The wait staff to table ratio is at least 1:1 – which meant we had our very own waitress and at least one other staff to help…and help they did! 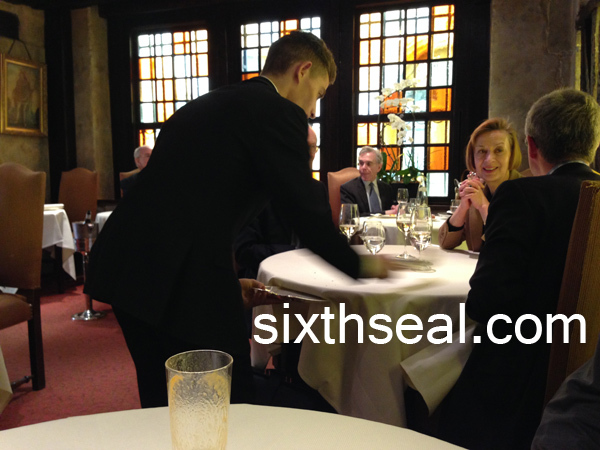 It was a little disconcerting, the level of service that was given – move your glass a little and they’ll come over with a smile to refill it and move it to just the right spot where it was before, facing the correct way. 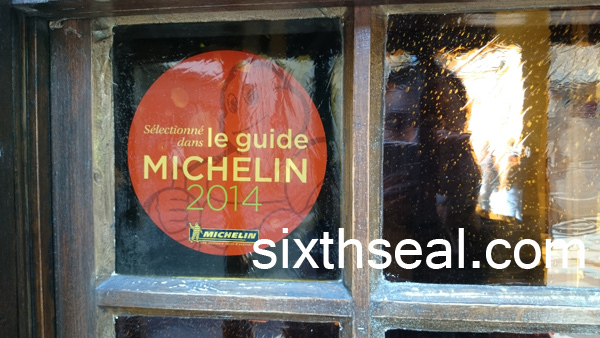 More about Michelin star level service in another post, I want to talk about the food! 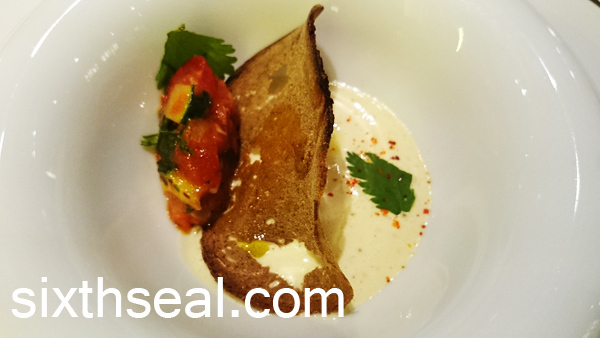 This is their signature appetizer which got them the Michelin stars. It’s what my dear ordered and it’s absolutely fabulous! I can eat this every day and not get sick! 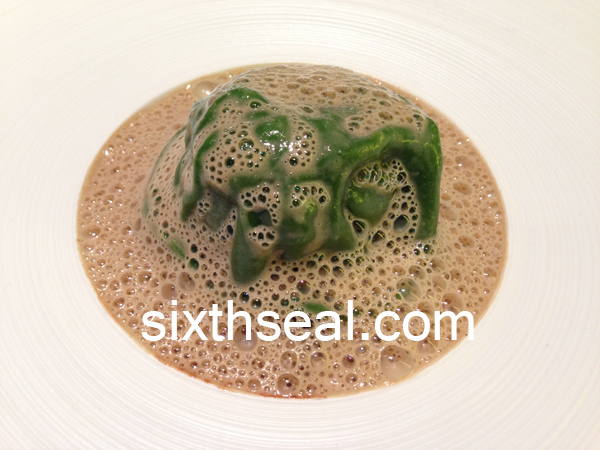 The beautiful ravioli is half lobster and half foie gras. It’s topped with a porcini mushroom foam that’s so intense I’ve never had anything like it before. A beautiful start to the meal. I ordered this solely on the waitress’s recommendation. 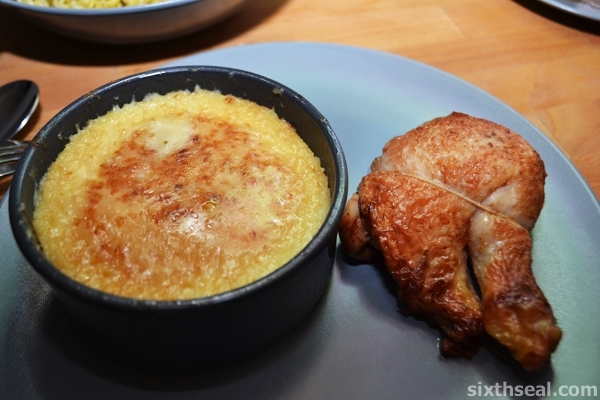 She said it’s a classic French dish – the kind the restaurant does best. 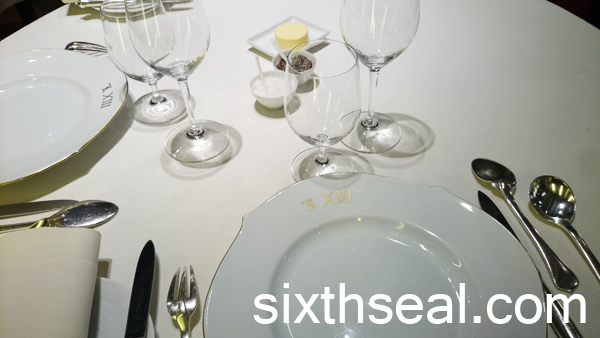 This restaurant serves classic French haute cuisine with minimal modernist touches and I thought this would go well. It’s toast topped with the brain of a calf and comes with nicely seared pieces of squid that makes an interesting texture combination, especially with the toast it’s served on. However, their flagship ravioli dish is slightly better I have to admit I secretly coveted my better half’s appetizer. Haha! This is what my dear had! 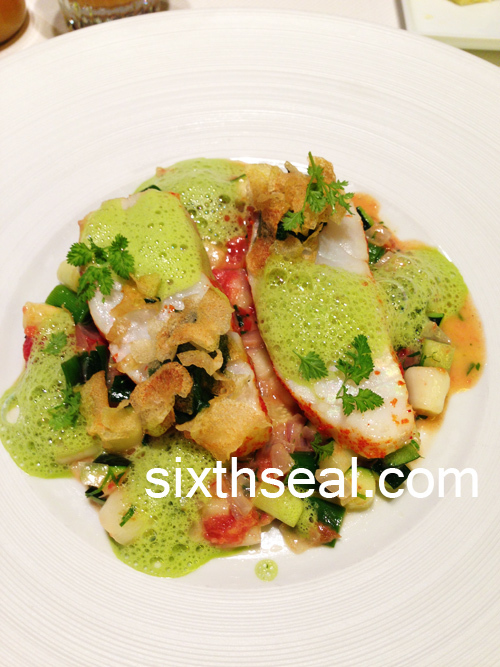 It’s a John Dory fish with tomato confit and a herb emulsion. We’ve always wondered what John Dory tastes like and when the waitress explained what this was, she ordered it immediately. 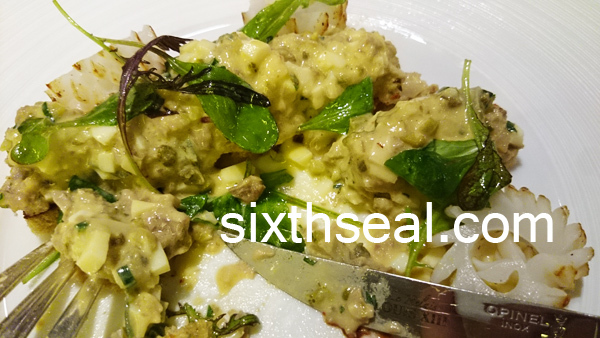 It tasted great – the fish was cooked perfectly (moist and tender) but it’s the kind of white fish that is popular in the West – bland by itself but absorbs flavors well, which is where the herb emulsion comes in, as a bit of a modernist touch. My order is sweetbread! 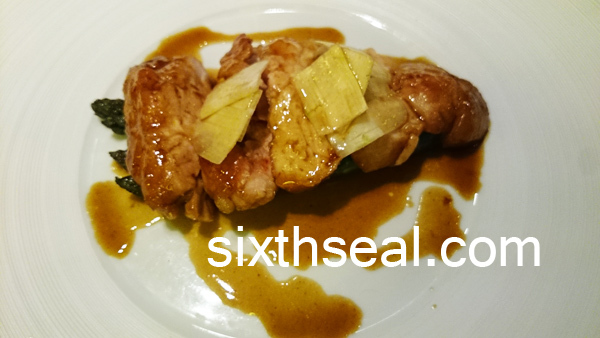 I’ve always wanted to eat sweetbread cooked by a classic French chef and here was my chance. I wasn’t disappointed! There’s an option to add macaroni with morilles (morel mushrooms) for an additional 14 Euros but I opted out as I wanted to taste it by itself and we ordered a lot of desserts. 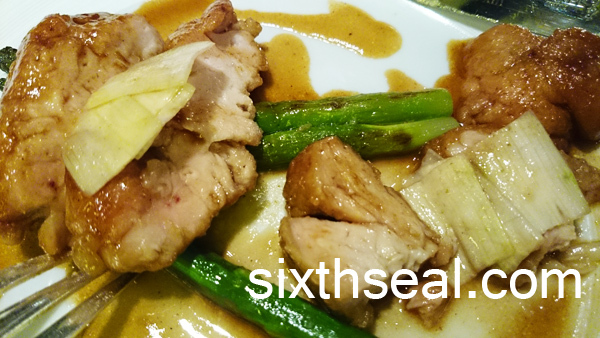 Sweetbread is the thymus gland of the veal and it’s a very rich and creamy dish. There’s also a bed of perfectly caramelized asparagus at the bottom which cuts down on the heaviness of the dish. I loved it! There’s nothing more French than a cheese course before the desserts and we both opted for it. This is one dish divided into two, instead of sharing from our own plates, French restaurants can actually portion one dish into two upon request! The selection of their cheeses also came with a delicious apricot chutney on the side! 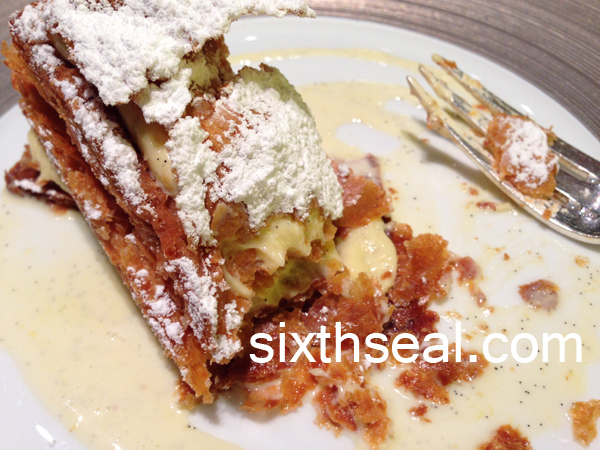 This is their famous millefeuille with Bourbon vanilla light cream! It’s probably their most famous dish and dessert and we opted for a shared dish (one dessert portioned into two plates). 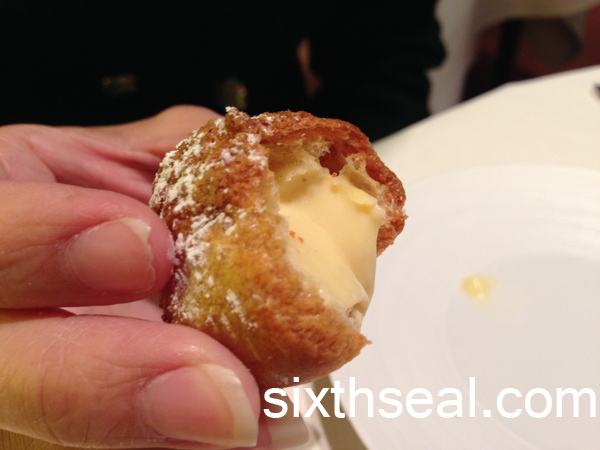 The awesome thing about Relais Louis XIII’s mille-feuille is that it’s deep fried! Words cannot do it justice, the crunchy texture of the dessert and the vanilla bean speckled custard made me nearly lick the plate to finish everything up! There’s a reason why it’s the restaurant’s most popular dish, you can’t get a better mille-feuille elsewhere! This is my adorable dessert, the mysteriously named “La Pomme” (The Apple). It’s one of their rare molecular gastronomy forays. 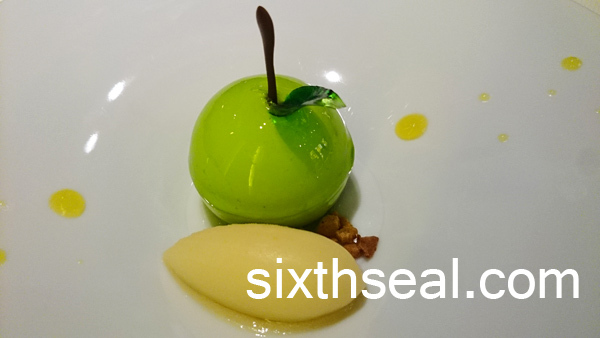 It’s a piece of art – there’s a cream filling inside the small “green apple” (complete with a fake chocolate branch and candied basil leaf). 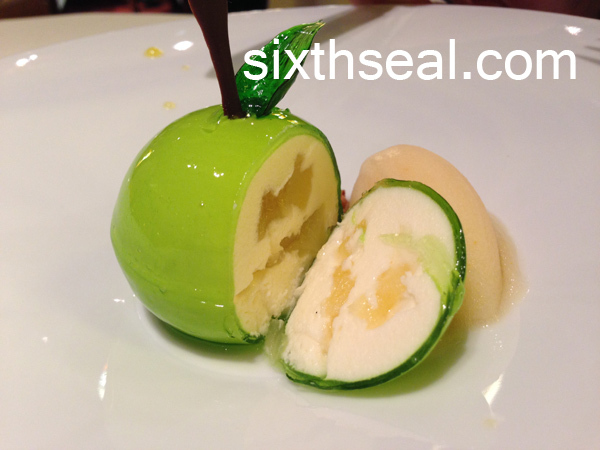 I was pleasantly surprised by the intense basil flavor of the crunchy “apple leaf” made of sugar infused with basil and the chocolate stick goes into the faux green apple (which consists of just a very thin layer of real apple tasting jelly) which in turn bursts with the filling. 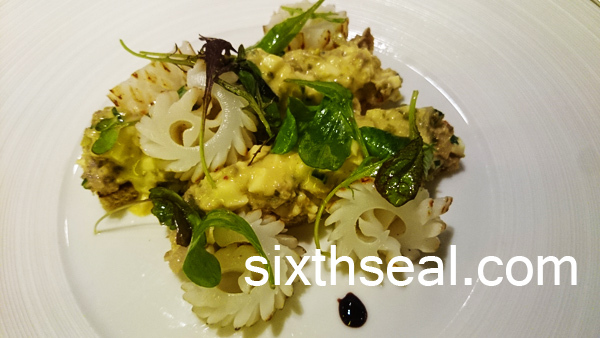 It’s a very intelligent dish that plays with your mind and mouth. There’s a sorbet on the side to cleanse your palate too! This is my dear’s dessert! It’s a chocolate tart that oozes with rich and creamy molten chocolate. 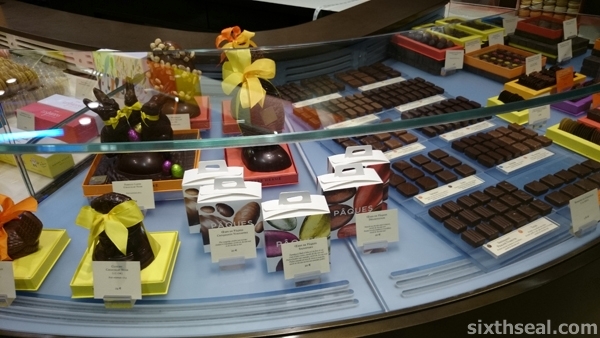 Not just any chocolate – their custom restaurant Grand Cru! 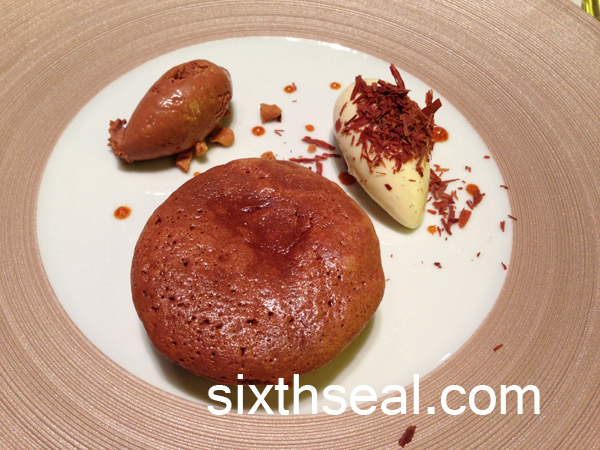 It’s on their daily special and the wonderful spin they put on the dish is with the two ice cream you see – there’s a vanilla quenelle and a chocolate rocher. The interesting bit is that the “chocolate ice cream” is *hot* and the vanilla bean ice cream is *cold*! The former is actually a ganache, plated like ice cream. 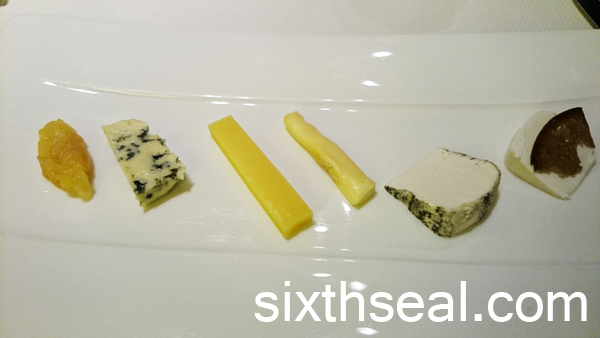 It really plays wonders with your palate – it’s genius, how they pull off these things! 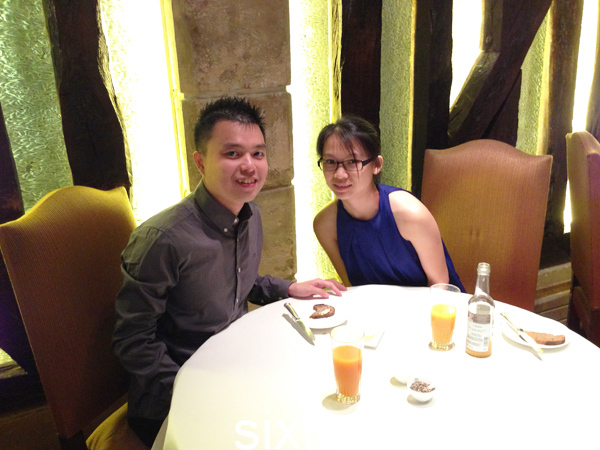 We thoroughly enjoyed our 2 Michelin star lunch at Relais Louis XIII. 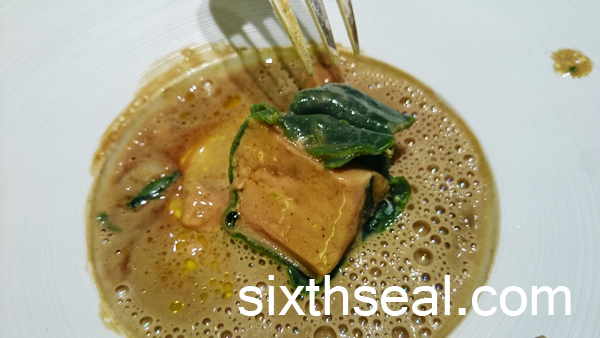 The restaurant has a few mixed reviews on the net about bad service but we received excellent service throughout, it’s the exact opposite of the snobbish French waiter stereotype. 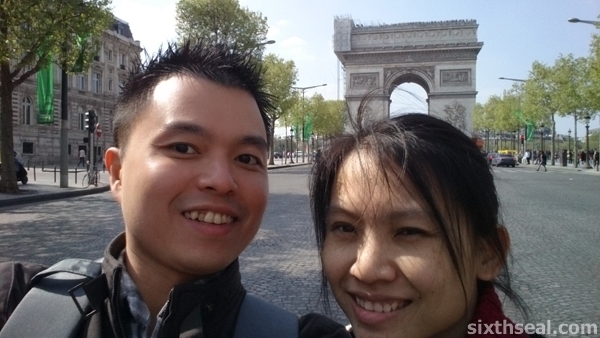 Champs-Élysées is a very prestigious address in Paris, the equivalent of Fifth Avenue in New York (although it was Parisian culture which started the latter). 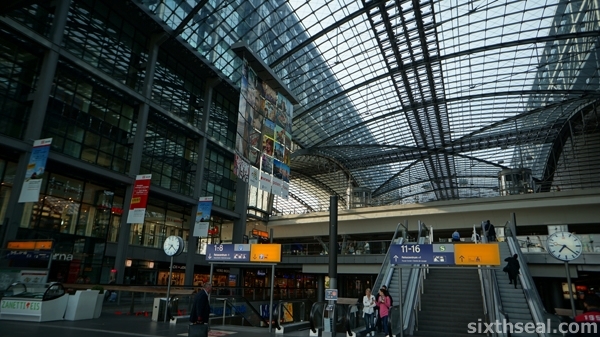 It’s very expensive to maintain a presence here coz the real estate is incredibly desirable. 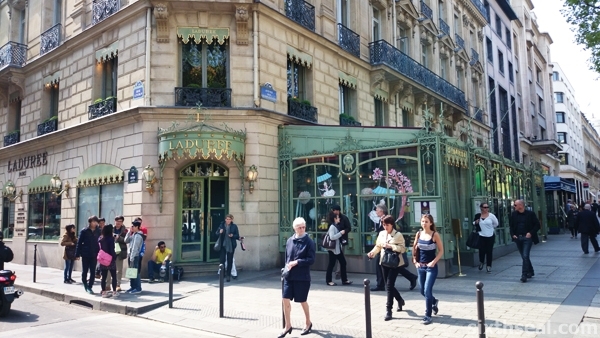 Ladurée actually calls their branches as “houses” or “boutiques” even though they’re technically a tea room – that’s how seriously they take their heritage! …to run into a long, slow-moving line of people. It was more than a queue, it was like watching the human equivalent of rabbits breeding! 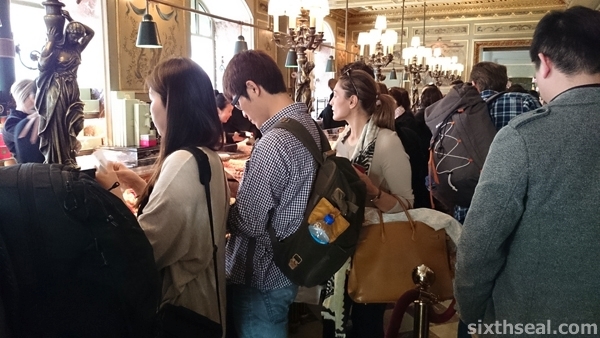 There are tourists, locals glaring at the camera toting tourists, and bemused passer-bys who got dragged in by the sheer force of the crowd swarming for Ladurée macarons. It was chaos, but organized chaos. 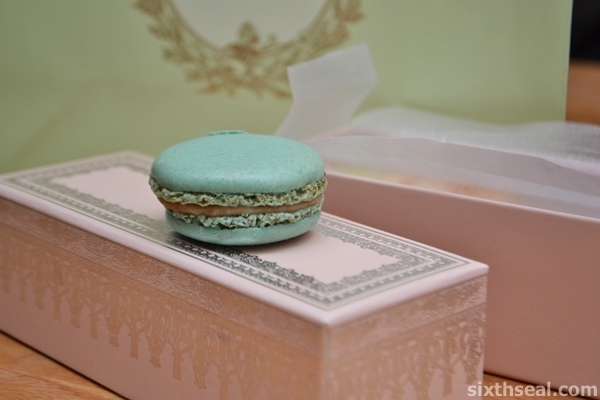 The blue Marie-Antoinette and the Red Fruits macarons are seasonal specials for Spring 2014! 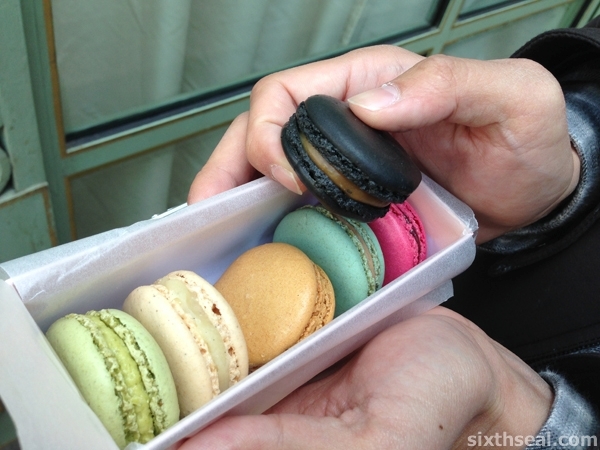 The six (6) macarons are all awesome and there’s one thing I noticed about vanilla in France – no one uses vanilla flavoring, it’s like it’s a culinary sin! Every place we’ve been, from Michelin star restaurants to cafes uses real dried vanilla fruits (which is the second most expensive spice after saffron!) and it makes a lot of difference! 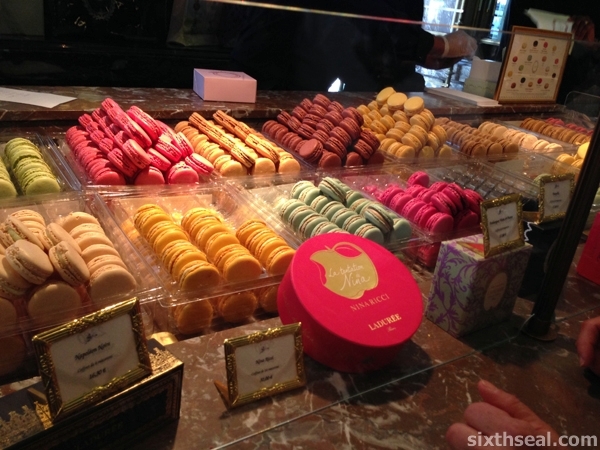 I quite liked some of the Ladurée macarons – the Marie-Antoinette, Salted Caramel and Vanilla are awesome but the best one is the one I switched to – Liquorice (swapped this for the recommended Lemon). The Liquorice macaron is black and when you bite into it, you get a mouthful of dry ash and acrid bitterness…and then the mild sweetness of the licorice filling hits you, for just a short while before it disappears and leaves a pleasant aniseed aftertaste in your mouth. 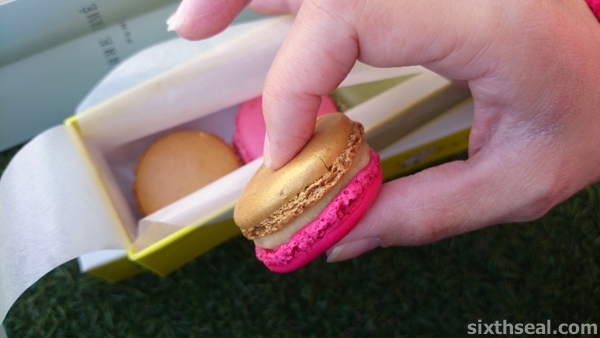 It’s ephemeral and epitomizes the macaron perfectly. 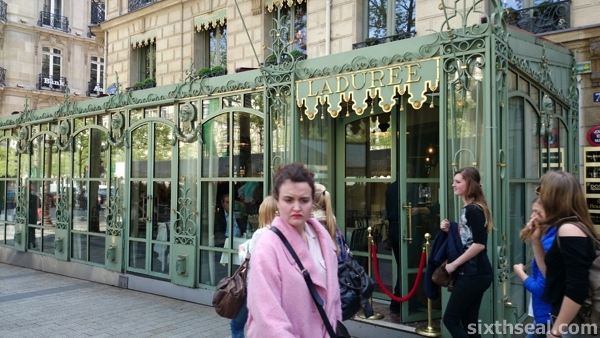 I’m not just trying to alliterate my words, but that’s how I felt about the Liquorice macaron. 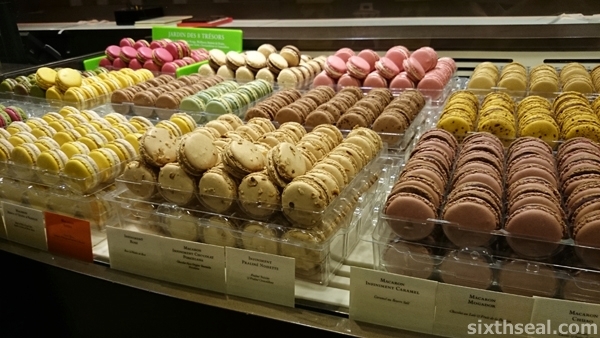 However, as for the others, I felt that Pierre Hermé macarons tastes better. 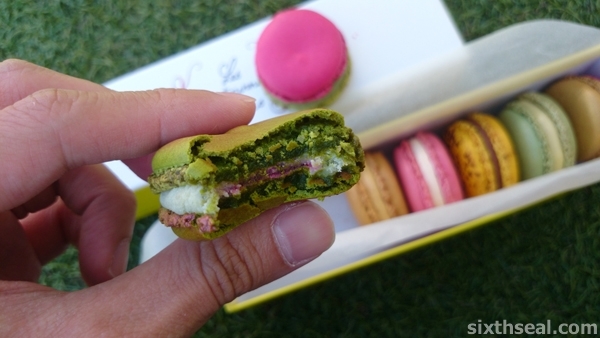 I’ll do a review of Pierre Hermé macarons soon – we tried both of the great French maracons and both were good! I know that both has branches here or close to us but they taste totally different. 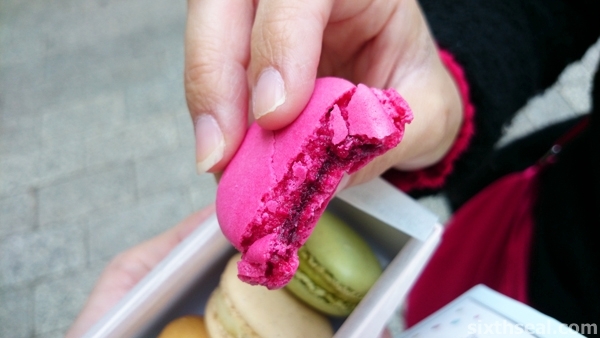 Macarons are supposed to be temperature controlled and eaten within 3 days and it doesn’t take well to importation or local ingredient substitution.